$40.00 M 1943 Infantry Sergeant shoulder straps (3 stripes), slip-on type, QUALITY REPRO. $50.00 ORIGINAL Artillery private shoulder straps, sew-in, circa 1945. No maker stamp. $19.00 M 1943 Artillery Private shoulder straps, QUALITY REPRODUCTION. Factory-made in Russia. $5.00 ORIGINAL Navy private service shoulder boards, slip-on type, 1950s. Nearly the same as M 43 boards used in the WW2 era by Soviet Corps of Engineers, Navy and Naval Infantry. Excellent unissued condition. Price per pair. $29.00 Infantry Junior Officer Field Shoulder Boards, slip-on type, QUALITY REPRODUCTION made in Russia. $3.00 ORIGINAL small silver rank star for junior officer shoulder boards	domed variation, with thicker arms of the star. Price for single piece. $8.00 Infantry "target" collar tabs, 1935 pattern. QUALITY REPRODUCTIONS. Look perfect. Price for single piece. $8.00 M 1935 NCO triangular rank insignia for collar tabs. QUALITY REPRODUCTIONS in brass and enamel. Price for single piece. $8.00 M 1935 junior officer square rank pips for collar tabs. QUALITY REPRODUCTION in brass and enamel. Price for single piece. $10.00 M 1935 senior army officer (major through colonel) rectangular rank pips for collar tabs. QUALITY REPRODUCTION in brass and red enamel (price for single piece). $10.00 M 1935 General officer (brigade commander or above) diamond- shaped rank pips for collar tabs. QUALITY REPRODUCTION in brass and red enamel, with a screw post and authentic looking screw plate showing a "maker's logo." Price per single piece. $8.00 M 1935 NKVD Border Guard junior officer square rank pips for collar tabs. QUALITY REPRODUCTION in brass and green enamel(price for single piece). $8.00 M 1935 senior NKVD Border Guard officer rectangular rank pips for collar tabs. QUALITY REPRODUCTION (price for single piece). $4.00 Air Force wings and propeller insignia for officer shoulder boards, original Soviet issue. Practically identical to WW2 Air Force emblems (price for single piece). $22.00 Original WW 2 era hat badge for an officer visor hat, approx. 32-34 mm width. 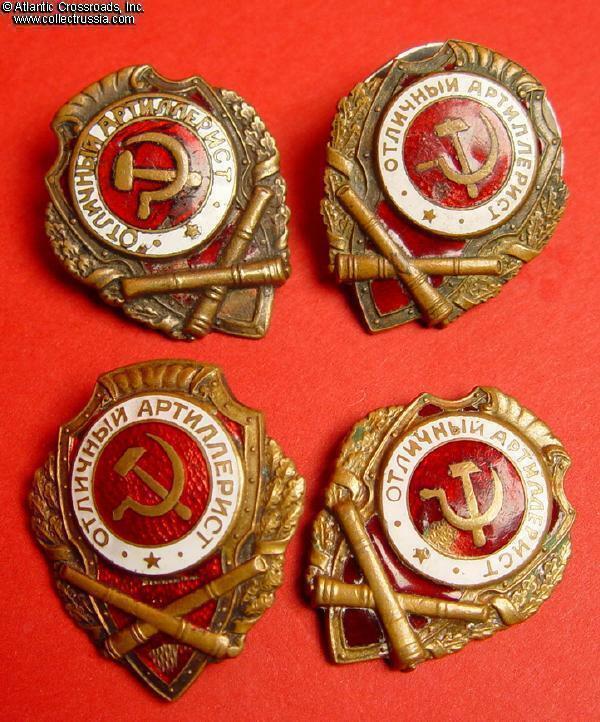 $14.00 Original WW 2 era Soviet officer or private side cap badge. $6.00 Original Soviet Army side cap field badge, heavy, painted olive drab. $20.00 M 1940 Air Force General hat badge, REPRODUCTION. $4.00 Brass button for Army officer or NCO shoulder boards, 1943 through late 1940s. 18mm in diameter. $10.00 WW 2 16mm tin button for gimnasterka shirt. Original WW2 manufacture. $7.00 WW2 era tin button for gimnasterka shirt, painted olive drab, 15.5 mm. $4.00 Button for officer or NCO tunic, 21 mm, ORIGINAL Soviet manufacture, late 1960s - mid 1970s. In excellent condition. $15.00 WW2 Type Brass button for gimnasterka shirt, 14 mm, circa mid to late 1940s. Hard to find smaller button in near mint condition. Several in stock. $5.00 Brass button for officer or NCO tunic, 23 mm, made in USA. $12.00 WW2 Type Brass Tunic button for Army officer or NCO uniform, 21.5 mm, circa mid to late 1940s. Several in stock, in mint unissued condition. $8.00 Guard's Badge, 1970s-80s. ORIGINAL Soviet manufacture, very similar to a WW 2, produced by the Moscow Mint.Excellent unissued condition.